If you are looking for a Letter to a Student just Beginning their Senior Year, please click here. Life is seasonal. We move from one season to another. As one season of life draws to a close, the next season is coming into bloom. Graduation is a rite of passage from one season of life into the next. It is an interesting rite, though, in that it is not just conferred, it is also earned. You have worked hard, completing 13 years of education. You have earned this graduation, and yet, it is also something that is conferred upon you. and really your entire network of love and support. That is why we all gather together tonight, to worship God with you, to celebrate your achievement with you, to witness your graduation from one season of life, and to commission you forward with prayers and blessings into the next. We welcome new people to our community, and we farewell those departing. We receive reports of news from within the community together. We seek God’s guidance and direction and future plan together. and we pray for the strength of marriages in our community. and we nurture strong and healthy working relationships with one another. We join our spirits in worship together. We join our hearts in prayer for the nations together. We join our minds in the study of God’s Word together. And so this graduation ceremony is part of the regular communion that is our collective life, together. Friends, you are not here just to witness an event, but to participate in it. You are not here tonight just as an attendee, but as a participant – a full-fledged Member of this Community – together with this graduate and his/her family. Worship God with them tonight! Celebrate with them. It is a celebration for you, too, as the Members of their extended network of support here. And pray with them and for them, both tonight, and in the coming weeks, as often as God brings them to your minds and hearts. Friends, may I speak a word over you tonight? Would you allow me to share God’s words for this graduate with you? I have heard that there are 365 references in the Bible to not being afraid: “fear not”, “do not be afraid”, “do not fear”. 365 times in the Bible, it says this, one for each day. Courage. Do Not Fear. Why are we not to fear? Is it because the flood waters won’t be terrifying? Is it because the flames of the fire somehow won’t be hot? No. It is because He will be with us. God is Emmanuel, He is with us. God has always been Emmanuel; He has always been with His people. And He is with us still. 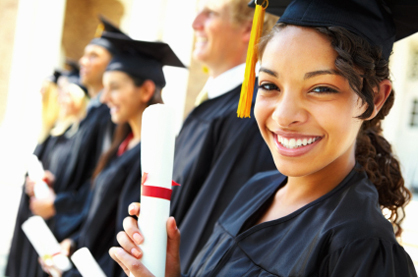 Graduate, I want to tell you that you are an asset to the Kingdom of God. The worldwide Church of God – the Bride of Christ, the Body of Christ – is a better and stronger and richer Kingdom because of your commitment, involvement, and gift of yourself to it. Do not withdraw from the Church – from the gathering of believers in Jesus’ Name. The Church is broken, and often hurting. She is imperfect, and She will always make mistakes. But She is Christ’s Bride, and He loves Her. The brokenness of the Church is not a reason to run from it, but a reason to run toward it. To bring your gifts, your talents, your unique blend of personality and character to support and build up the Church. 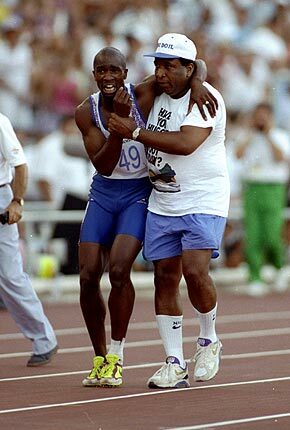 The 1992 Olympics held in Barcelona, Spain provided one of track and field’s most incredible moments. England’s Derek Redmond had dreamed all his life of winning a gold medal in the 400-meter race, and his dream was in sight as the gun sounded in the semifinals at Barcelona. He was running the race of his life, and he could see the finish line as he rounded the turn into the backstretch. As the medical attendants were approaching, Redmond fought to his feet. “It was animal instinct,” he would say later. He set out hopping, in a crazed attempt to finish the race. When he reached the stretch, a large man in a t-shirt came out of the stands, hurled aside a security guard and ran to Redmond, embracing him. It was Jim Redmond, Derek’s father. Fighting off security men – the son’s head sometimes buried in his father’s shoulder – they stayed in Derek’s lane all the way to the end, as the crowd gaped – then rose – then howled and wept. Derek didn’t walk away with the gold medal that day, but he walked away with an incredible memory of a father who, when he saw his son in pain, left his seat in the stands to help him finish the race. God doesn’t care where you place. He just wants you to Finish the Race. And He’s the Father who’s there to help you do it. Graduate & Supporters: We often mark our lives by our key victories and failures. We often see how God is with us during the victories, and wonder where He is during the failures… The truth is, He is with us always. He walks with you, experiences your failures and triumphs both with you. Often He carries you, and was the only reason you made it through the hardest times anyway. He was there. He is always there. 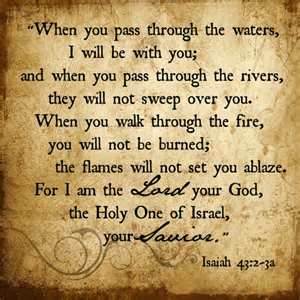 Even when you walk through the valley of the shadow of death, He is with you. On this, the night of your Graduation, I congratulate you! I join with your community of Supporters in celebrating you, in thanking God for your life, and in sending your forward with prayers and blessings into the next season of life He has prepared for you! ← Why does Jesus want us to “become like little children”? What a fantastic word to the graduates and the entire AFM community!